Don’t panic. If you’ve made your meta descriptions longer than 155 characters, I’d advise tmakingthem shorter though. At least for your most important articles. 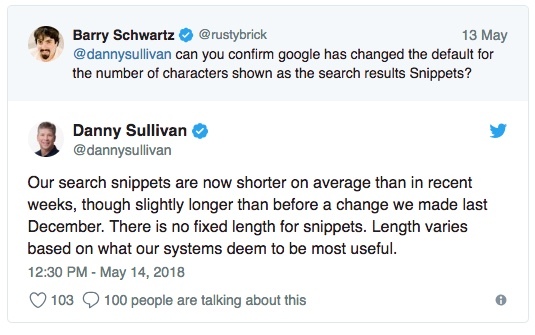 In most cases, Google will not show the long descriptions anymore and you don’t want Google to cut off your meta descriptions in the middle of a sentence. So you’d want to rewrite these meta descriptions, making them fit Google’s new rule. If you decide to rewrite them, always keep in mind that it’s best to start with the most important information first. That way, if the length changes again, you’re pretty sure that that part won’t be cut off. If you go to the snippet editor in the Yoast SEO plugin now, you’ll see the old meta description length. By ‘old’ we mean the ‘new’ one – about 320 characters – which is outdated already. So we’ll change the meta description length. Again. It will go back to what it was: about 155 characters. This change is scheduled for the 7.6 release which will roll out in two weeks. And then, hopefully, it’ll stay the same (at least for a while).